The name arrowhead violet refers to the distinctive oval-to-triangular shape of the leaves. 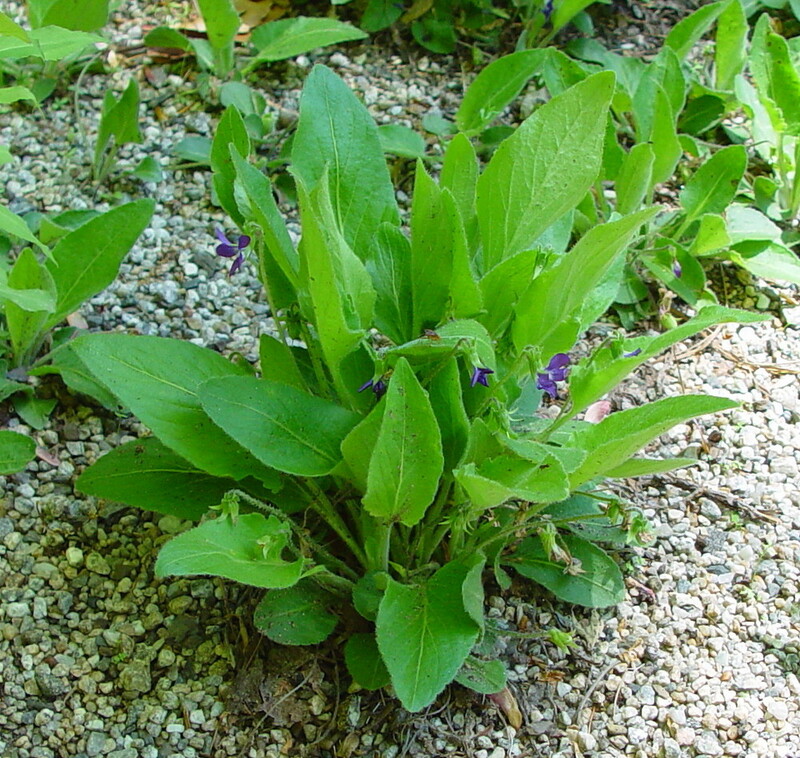 The Iroquois used a compound of this plant to detect bewitchment. There are two varieties in New England. 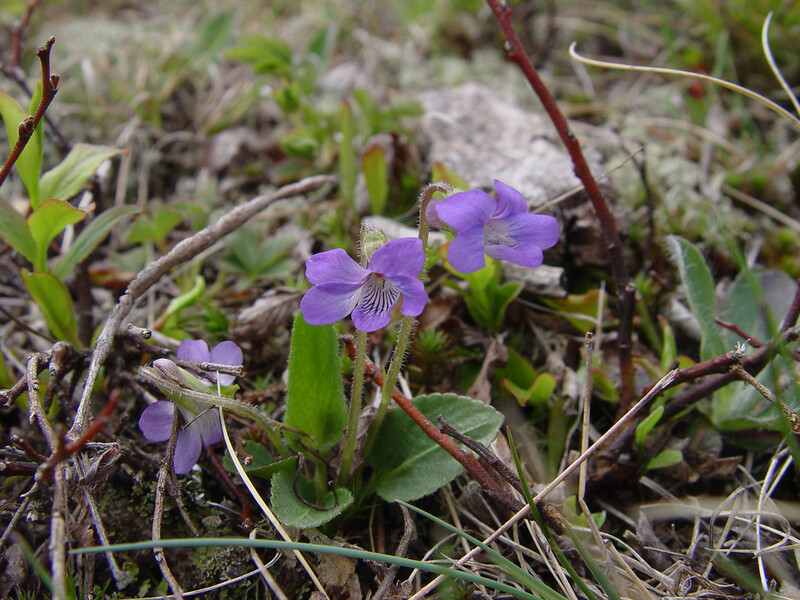 One (Viola sagittata var. ovata) is present in all New England states, while the other (V. sagittata var. 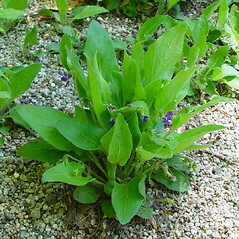 sagittata) is found only in Connecticut, Massachusetts and Maine, and is rare. 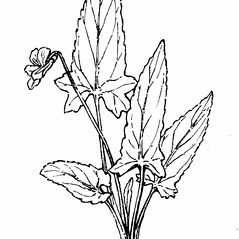 Various hybrids of arrowhead violet occasionally occur. 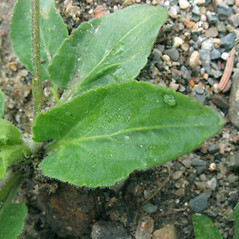 leaf blades commonly less than 1.75 times as long as wide, definitely cordate at the base, the teeth at the base of the blade no more obvious than those along the middle of the blade margin, and sepals eciliate (vs. V. sagittate, with leaf blades 1.5–3 times as long as wide, cuneate to subcordate at the base, often more coarsely serrate or even somewhat lobed at the base of the blade, and sepals commonly ciliate). 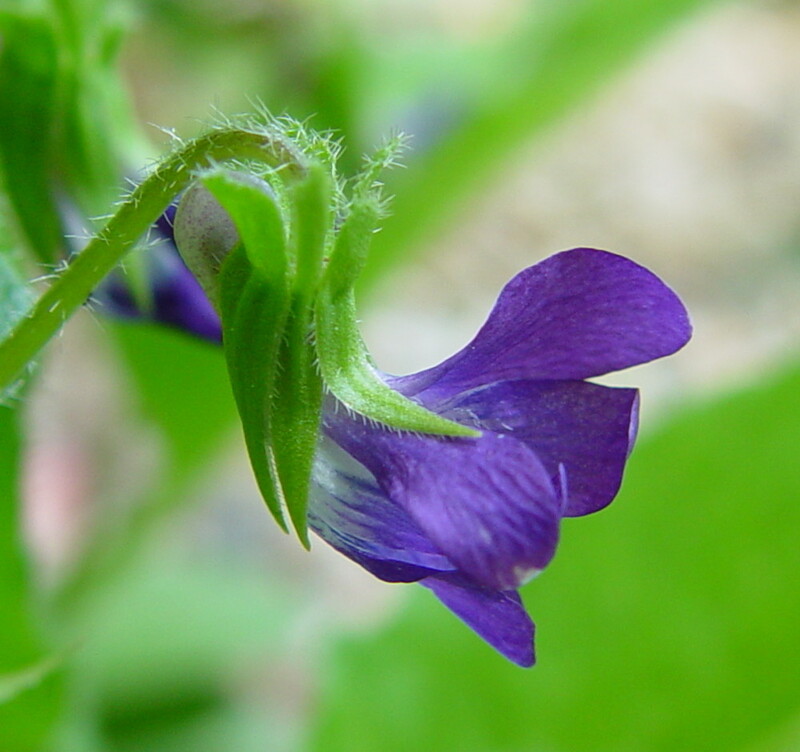 spur 5-10 mm long, lateral petals glabrous, and stipules connate to the petioles (vs. V. sagittate, with the spur shorter than 2-3 mm long, lateral petals pubescent, and stipules distinct from the petioles). 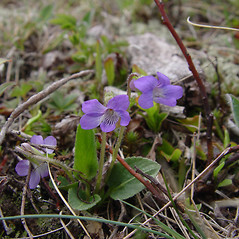 Viola sagittata Ait. var. 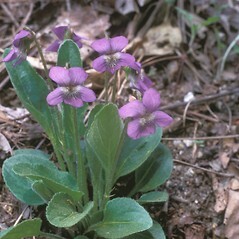 sagittata is known from CT, MA, ME and is of conservation concern.V. 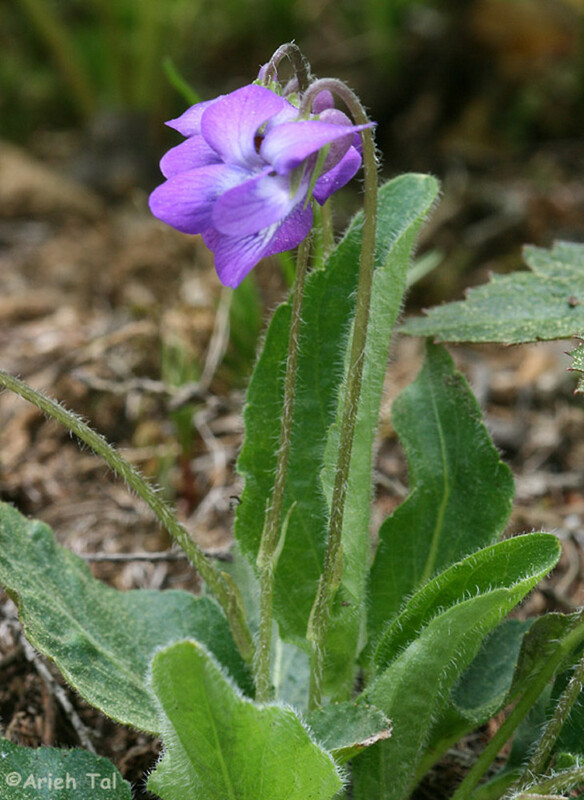 sagittata var. ovata (Nutt.) Torr. 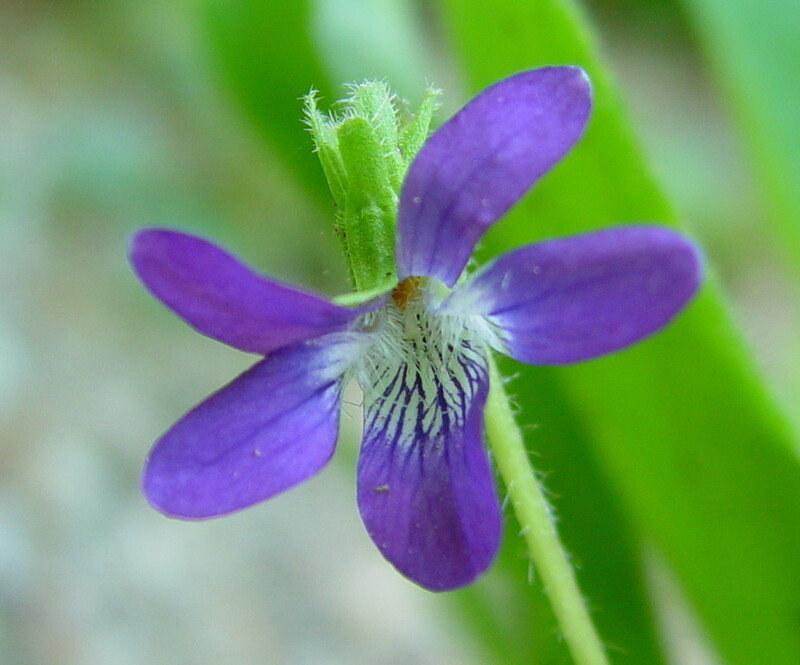 & Gray is known from CT, MA, ME, NH, RI, VT.
arrowhead violet. 25a. 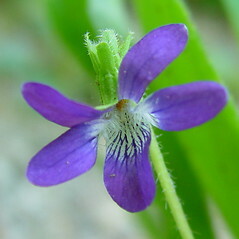 Viola fimbriatula Sm. ; 25b. 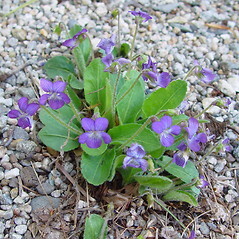 Viola emarginata (Nutt.) Le Conte; V. emarginata (Nutt.) Le Conte var. acutiloba Brainerd; V. sagittata Ait. var. 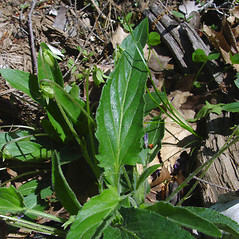 subsagittata (Greene) Pollard • CT, MA, ME, NH, RI, VT. Fields, roadsides, waste areas, woodlands, clearings, meadows, shorelines, lawns, swamps. 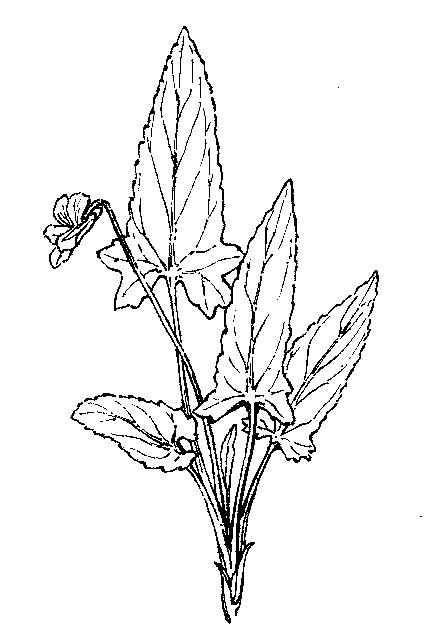 Variety ovata is known from CT, MA, ME, NH, RI, VT. 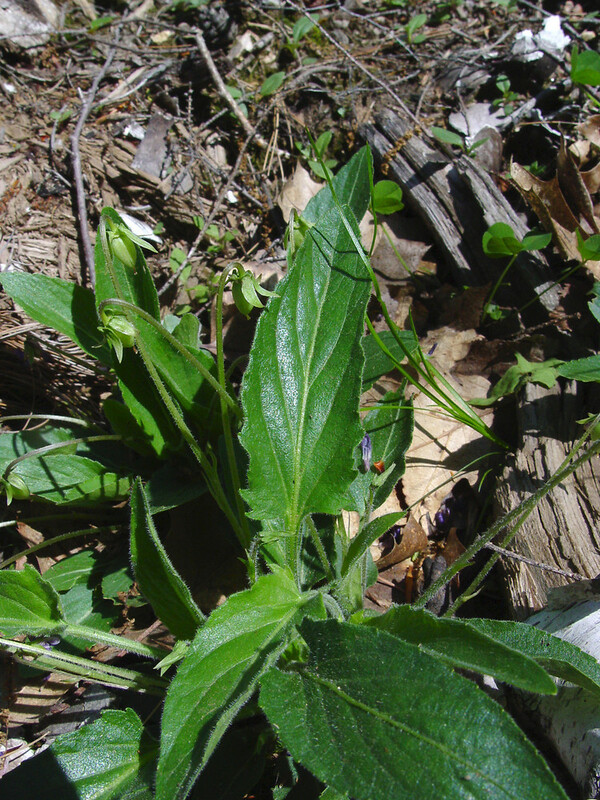 Variety sagittata is known from CT, MA, ME and is of conservation concern. 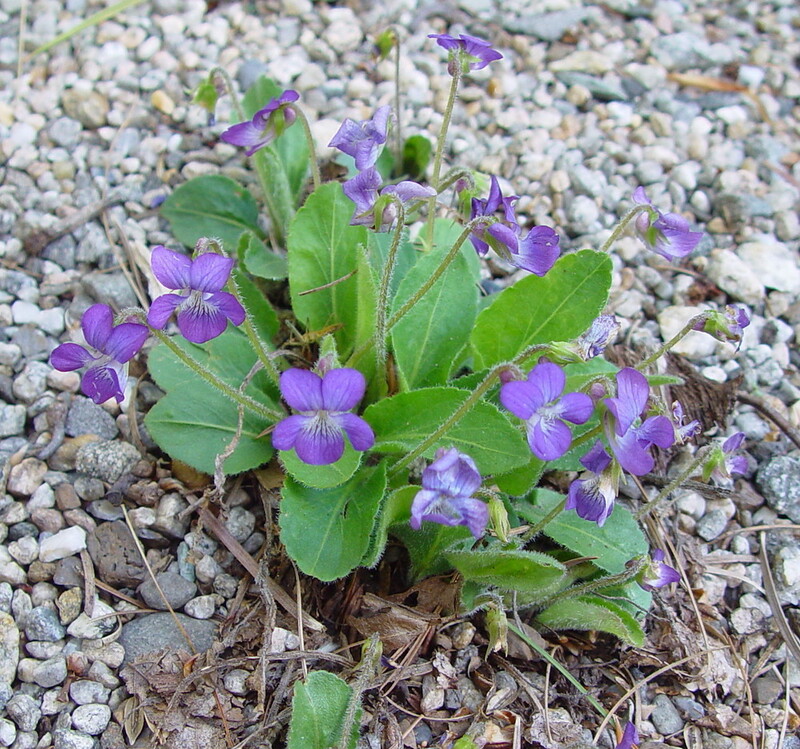 Reports of this variety from RI and VT (e.g., Seymour 1982) are based on specimens of Viola sagittata var. ovata (though it is expected to occur in RI). 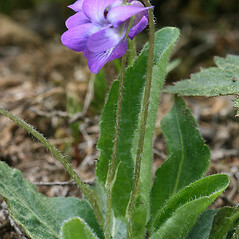 Variety sagittata, though often from dry-mesic habitats, is more often found on mesic to wet-mesic substrate than is var. ovata. 25a×25b. 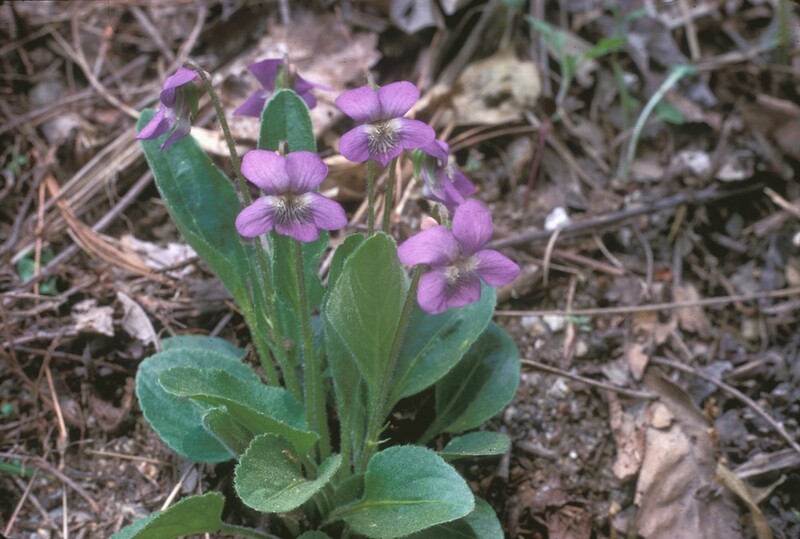 Viola ×‌conjugens Greene is a very rare violet hybrid known from CT, MA. The plants usually have pubescent foliage and vary from displaying intermediacy in characters to combining different character states from the parental taxa. 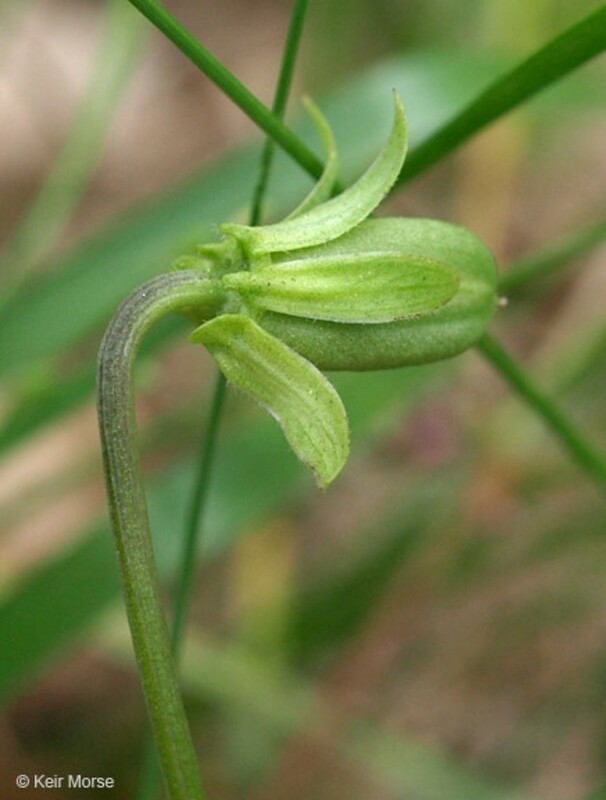 Given that the two varieties forming this hybrid are not always sharply distinct (i.e., intermediate plants are infrequently collected), sterility of capsules is an important character to use to determine hybrid origin (in addition to intermediate or confounding character states). 25a×27. 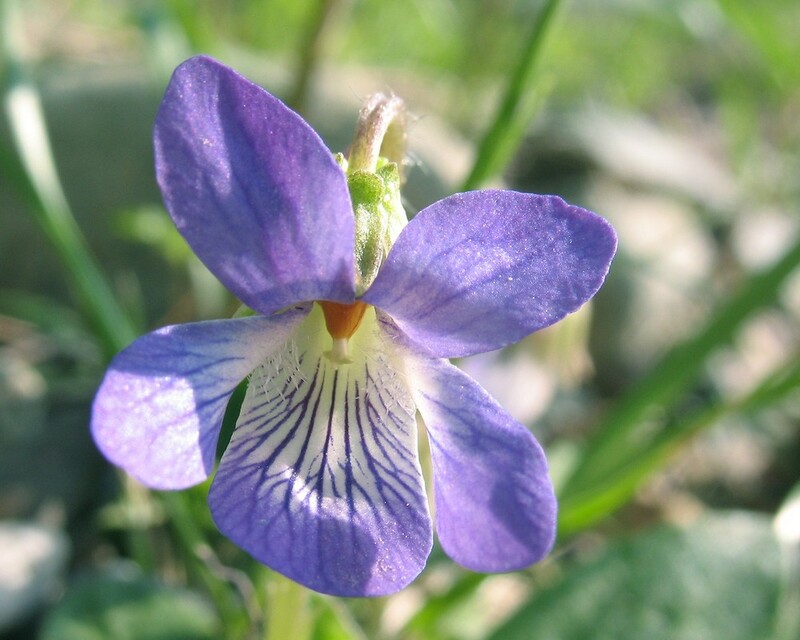 Viola ×‌fernaldii House is a rare violet hybrid known from MA, ME, NH, VT. 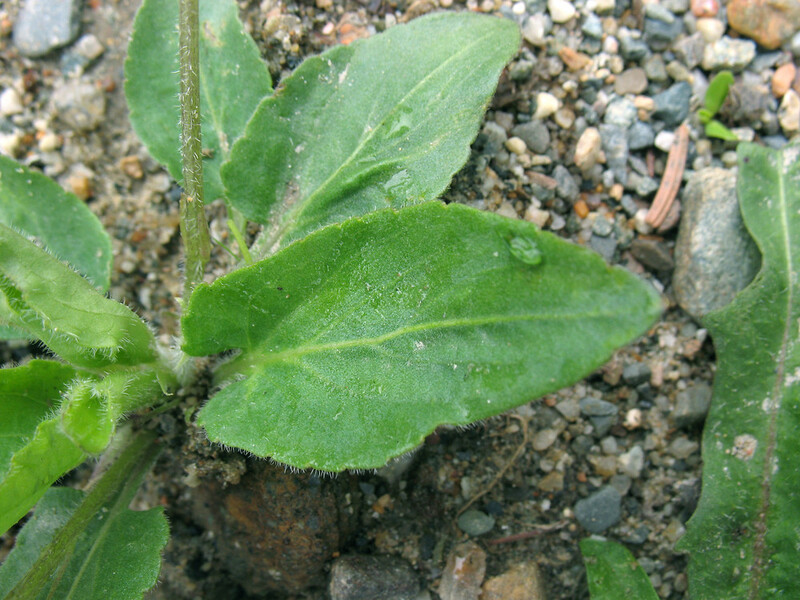 It has pubescent foliage with leaf blades that are narrow-ovate (intermediate between the parental taxa). 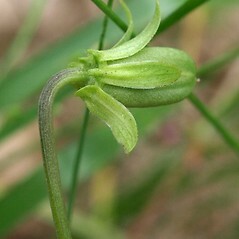 The sepals are ciliate (as in the parents) and are generally more elongate than in V. sororia. 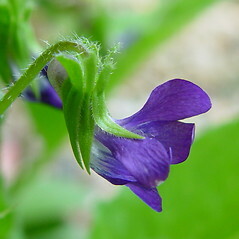 The fruits vary from green and obloid to marked with purple and subglobose. 25a×29. 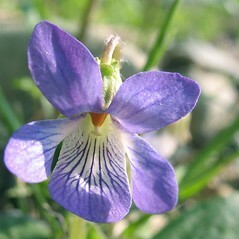 Viola ×‌convicta House is a very rare violet hybrid known from CT. 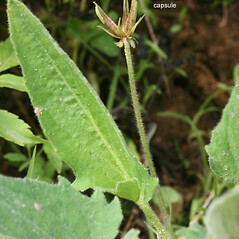 It has pubescent foliage with narrow-ovate to ovate leaf blades that show a broad, sometimes elongate, terminal lobe and 3–6 short, sometimes tooth-like, lobes along the basal margin. The bases of the leaf blades vary from cordate to nearly truncate. 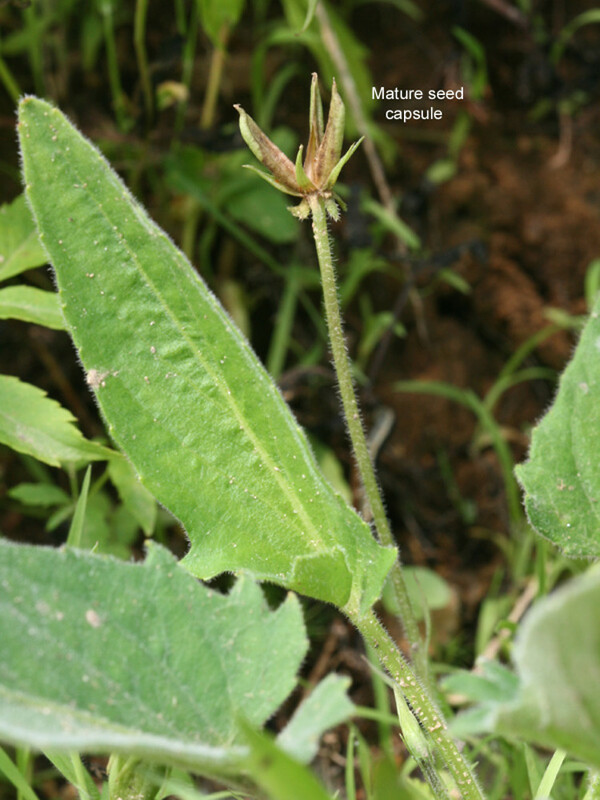 Sepal characteristics tend to be intermediate between the parents (lanceolate and acute to acuminate at the apex in V. sagittata, ± broad-lanceolate and obtuse at the apex in V. subsinuata).